In Greek mythology, the Pegasus was an immortal creature. As the story goes, the Pegasus sprung from Medusa’s neck when the Greek hero, Perseus, cut off her head. The flying horse was tamed and given his name by Athena, the goddess of wisdom. Athena presented Pegasus to the Muses, where he was placed at the service of the poets. Legend has it that the Pegasus struck the ground on Mount Helicon with his hoof, and a spring sprouted from that location, giving inspiration to those who drank its waters. In the earliest days of oil refineries and filling stations, the Pegasus symbol was used by the Standard Oil Company of New York. The logo first appeared in 1911 on their gas pumps and petroleum products. When the Standard Oil Trust was broken up by the Supreme Court (1911), two of its divisions – the Standard Oil Company of New York and the Vacuum Oil Company – merged. The former brought with it the Pegasus logo, the latter brought the Mobilgas name. 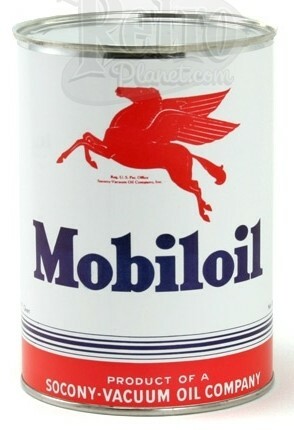 The Pegasus was also used on Mobiloil and Mobil Tires. The Pegasus appeared on Mobilgas products during 1911, but it was in 1931, with the forming of Socony-Vacuum, that it was officially adopted as a trademark. The flying horse was first colored red by an artist at the Mobil Sekiyu division in Japan. A major makeover was done in the 1930s by the commercial illustrator Robert “Rex” Elmer. Not only was it given a cleaner and more graphic appearance, but the horse now flew from left to right, as opposed to from right to left. Through the years there have been gradual changes to the rendering of the red horse, but the symbol itself has stood strong. 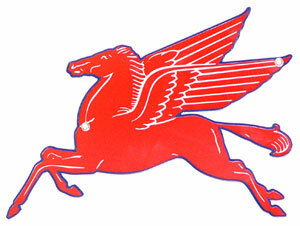 The Pegasus symbol is still used today by ExxonMobil, symbolizing imagination, power and speed. The bulk of vintage collectibles adorned by the Mobilgas Pegasus are gas station signs and oil cans, but many take-home items were produced, including ashtrays, license plate toppers and coffee mugs. Those wanting to decorate with vintage-style signs and decor also opt for more affordable reproductions. Do you own any original items from the Mobilgas era? Chime in and share your collection.